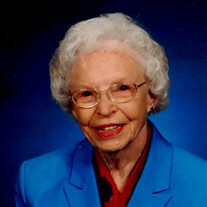 Edith M. DeBusk, 97, of Kingsport, TN, died peacefully after a period of declining health. She was born in Bristol, VA and moved to Bristol, TN at an early age. She graduated from Bristol TN High School and received a BA degree from King College where she was valedictorian. She taught school in several of the area schools including Saltville, VA High, Holston Valley High and Bristol TN High. Mrs. DeBusk and her late husband, Ralph, moved to Kingsport in 1954 where in her younger years she was active in PTAs, Women's Symphony Committee, Church Women United and other organizations. She was an exceptionally dedicated homemaker with devotion to her husband and family throughout her life. Edith was a member of Holy Trinity Lutheran Church where she served in various capacities including Sunday School, Church Council as the first female member, and the Lutheran Women's Group both locally and in the Tennessee Valley District. She enjoyed traveling with Ralph in their motorhome to 49 states. She and Ralph spent many winters in Sanibel, FL where she enjoyed the beach and creating shell flower arrangements. She also enjoyed sewing and was an avid reader. She was preceded in death by her husband, Ralph Edward DeBusk, mother and father, Trula Booher McCroskey and Guy Lee McCroskey; and siblings, Guy Homer and Velma McCroskey; and daughter-in-law, Lisa DeBusk. Survivors include children, Betty DeBusk Turner (Don), David Francis DeBusk (Dawn), and Janet DeBusk Allen (Tom); grandsons Stuart (Beth) and Scott (Amanda) Yeatts, Christopher (Christi) and Travis DeBusk, Brad and Drew Allen; great grandchildren Aubrey, Barrett, and Jamison DeBusk, Reagan Yeatts, and Liam Yeatts; step grandchildren Danielle Contway (Ryan) and Ashley Donahue; and step great grandchildren Hayden, Kaylee, and Ryan Christopher Contway. Special appreciation to the caregivers for our loving mom, Dawn (primary caregiver), Jan, Freda, Robin, Jane, Nancy, and Janie. The family will receive friends on Saturday, June 23, 2018, from 12 to 1 pm with funeral service to follow at Holy Trinity Lutheran Church in Kingsport with Pastor James Bangle officiating. Interment at Oak Hill Cemetery will follow the service. In lieu of flowers, memorial contributions may be made to Holy Trinity Lutheran Church, 800 Broad St., Kingsport, TN 37660.